this realm yet worthier of their Sacrifice. Boxford War Memorial – Dedication Service, 1 Apr 1922. Saturday afternoon, April 1st, will ever be remembered by young and old, in the parish of Boxford, as at three o’clock on that day the monument raised in memory of the brave men who gave their lives in the Great War was unveiled in the presence of a large assembly of parishioners. Snow covered the landscape, but fortunately it had melted on the roads, thus enabling friends from the outlying parts of the village to be present. The main body of the people arrived at the site (which is on a green, close to the church) in processions – Ex-Service Men under the command of Major Archer-Houblon; Women’s Institute, headed by Mrs Peaker, president, and Mrs Butler, secretary; the school-children conducted by Mrs K Edwards. On arrival, all were arranged in an orderly group by Mr Peaker, an ex special constable. One was struck by the reverent attitude of all present, even the very small children, and those in charge of motors or vehicles passing at the time, either stopped or slowed up, baring their heads in honour to the brave soldiers. The first part of the service was taken by the Rev C A Boden, and the latter part (after the unveiling) by the Rev T W Beck, of Newbury. The hymns sung were “Stand up, stand up for Jesus” and “Holy Father in Thy keeping,” Mrs Clough accompanying on the church organ, with the doors and windows open. The unveiling was performed by Major Clough and Mr J Huntley, two ex-service men chosen as representatives by their comrades living in the parish, who had served in the War. 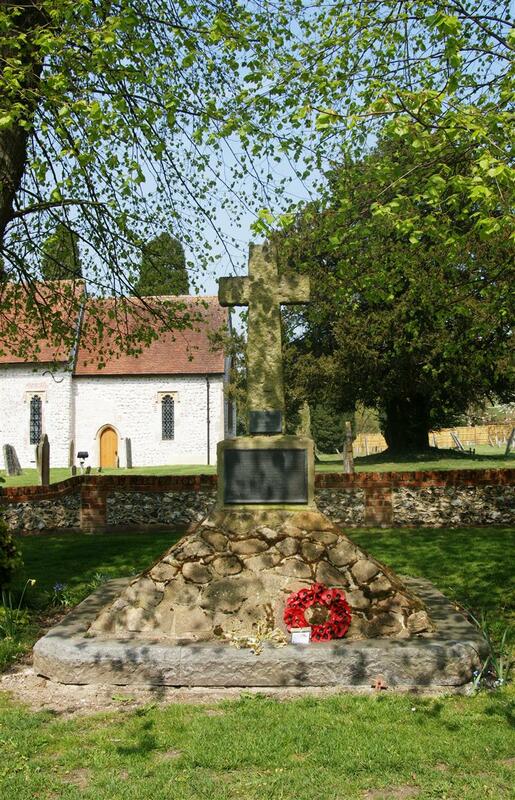 After the unveiling and dedication, the following address was given by Colonel R L Bayliff: “We are met here to-day to do honour to those who from this parish in the Great War gave their lives for their King and the land they loved so well. When their country, in her dire need, called them, willingly they answered; they went, they fought, and they died – for us. They rest far off – one, his watch over, in the depths of the North Sea; others in the fair land of France, or on more distant shores, in “some corner of a foreign field that is forever England.” Here in their native place, to which, on sea, in camp, or in field, their thoughts must often have turned, we have raised this stone in token of the love we bear them, and of our gratitude for the sacrifice which they have made. Deep in the hearts of those they loved is their memory enshrined, and when we ourselves have followed them in the Great Beyond, may this memorial serve to remind those who come after us, as they read the names graven thereon, of the debt which they owe to these Our Glorious Dead, and strive to pay that debt by making the world a better place; and should the call sound forth again, follow in their footsteps – even unto the end.” The National Anthem was played on the organ, the people standing at attention in silence, and the “Last Post” was sounded by two buglers from the Royal Berks Depot at Reading. Before dispersing, lovely wreaths, flowers and laurels were laid on the base of the Memorial, a specially beautiful one of red, white and blue flowers being given by the school-children. The inscription was drafted by Mrs Peake, and the cross designed by Mr Michael Waterhouse, architect, and carried out by Mr Thorn, stonemason, of Newbury.